Are the Lebanese Forces simply sectarian? I got into a debate with a friend who argued that the Christian parties of Lebanon, mainly the Phalangists and the Lebanese Forces, were sectarian in similar fashion to reactionary, opportunist groups such as Hezbollah and the rest of the political spectrum. While I do agree that every single political group in Lebanon is taking an exclusively sectarian approach to politics, and exploit the followers to serve the small group of leaders at the top of each Pyramid, the Phalangists and the Lebanese Forces in particular are not just sectarian, they’re actually fascists. The Lebanese Forces will argue that they put him under house arrest at at the end of the civil war, but that was only to please the Saudis who didn’t like his rhetoric. He fought alongside the Maronite in the Lebanese Front for years, and they never had a problem with him, until they turned against him after the war was completely over. It’s interesting because when he talks about an ‘invasion’, he refers to the North being ‘occupied’ by Palestinians and Syrians, but never to the South’s Israeli presence. Also in the second part, Sami Gumayil (son of Amin, grandson of Pierre) announces that his identity, and therefore that of that group, is Maronite, Syriac, Christian and Lebanese. This is extremely important because, besides the fact that no other party would say that, Sami is clear that Lebanon is NOT Arab, and that the Taif agreement only went through because the Syrian tanks were overlooking the referendum. But they reject foreign interference when it’s Arab, but never when it’s Israeli. And the difference is purely ethnic and racial, not political. Sharon was blatant about the plan of the invasion, whereby the Israelis would occupy the entire southern part of the country until Beirut, and then the Phalangists/Lebanese Forces would do the dirty work in the city. This invasion had nothing to do with the sovereignty of the Lebanese state, obviously, it was clear that the problem was not with “foreigners”, it was with Arabs and Muslims. The documentary also talks about the siege of Beirut, and how the Israeli tanks were firing the Palestinian/Muslim areas. Basically, the Phalangists were not attacking armed “enemies” as much as they were attacking the poor who posed a serious threat, which is exactly what defines fascists. This was a threat for the rich, and the unjustified hatred towards Palestinians, Arabs and Muslims was the way to declare the class of wars. As Camille Chamoun clearly states, the right-wing Christians were fighting to defend the rich elite of Lebanon. They weren’t fighting foreigners, they were fighting the poor who were threatening the rich, and this has nothing to do with their nationalist rhetoric. That is partly why they claim that the Muslims don’t work, suggesting the Lebanon should get rid of them to prosper. Also in the report, Dani Chamoun – from the National Liberation Party that was founded by his father, Camile, and has always been in alliances with the Phalangists, and at points during the war under the direct command of Bashir Gumayil – openly asks for outside help to fight, even though they’re supposed to be getting rid of outsiders in Lebanon. But the fact of the matter is that they’re trying to destroy the poor and the leftists, embodied in the Muslims and Arabs. In the 15th minute, the volunteers for the Phalangists say that they are fighting the “global left”, which is being financed by Libya! And then Dani Chamoun says “If Lebanon falls to the Left, then we’re really in trouble”. To conclude, fascism is basically the Right’s method of defeating the Left and saving the capitalist system. In order to do that, fascism needs to direct hatred towards a certain race/religion which is blamed for all problems. And this hatred has to be towards people who, whatever they do, cannot change themselves and will always become enemies. That’s what happened with Hitler, Mussolini, Franco, etc. 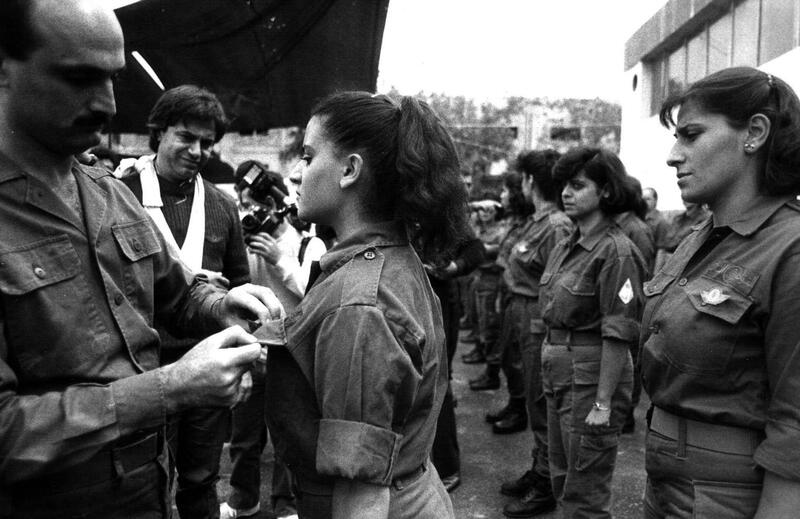 In order to fight the threat of the rise of the Left in Lebanon (embodied in the Palestinian struggle by people of all races, and protests against the regime and the leaders), the Phalangists stepped up as the fascists to protect the regime, calling on the Lebanese Christians to hate the Muslims and Arabs, and calling on the international community (and Israel) to help them otherwise Capitalism might fail in the country. They are longing for a “prosperous” Lebanon where the rich made lots of money, and the poor were exploited with no opportunity ahead of them. What was most important for them was the destruction of the rising Left, and this was to be done via the destruction of the Palestinians and any sort of struggle. Phalangists and Lebanese Forces’ supporters are sectarian just like any other party, but the party itself, and the prominent figures within the ranks, are actually leading a fight to destroy the revolutionary movements by killing anyone involved in emancipatory movements, and especially the Palestinians and the leftists. Those are fascists. They are the embodiment of the counterrevolution that come to life at times of revolutionary aspirations. Contrary to what they constantly claim, the last thing that they want is a Lebanon with some sort of social justice. In fact, the fascist party would have no problem in not taking power, as long as the capitalist structure is in place, and the threat of all revolutionary movements is diminished. For that reason, fascism is much, much worse, and far more dangerous, than opportunism – even if, from a superficial standpoint, it all seems like sectarianism at the end. It’s unfortunate that the author of this blog has been stranded in the 70’s-80’s. The Lebanese Forces has transformed today to a democratic political party which has the support of many Sunni Muslims in Lebanon and counts within its members a few of them. I agree that context is extremely important, especially when discussing the Lebanese civil war, but this would require hundreds of posts, and this short post simply presents the argument that the Lebanese Forces’ sectarianism stems not from opportunism, but fascism. I would immediately argue that fascism is never, ever explainable, let alone in anyway justifiable. But that’s neither here nor there. I don’t oppose the Lebanese Forces and their allies for the mass killings and “their mistakes” – although that’s enough to completely ban them from political activity and throw their leadership behind bars – I strongly oppose them because they will always, without exception, stand against any revolutionary movement in the area, and as fascists will do all they can to protect capitalism in its current form. Nothing about their reasoning is damn good, that’s for sure. If you were to agree with me that the Lebanese Forces were fascists during the 70s and 80s, for argument’s sake, how could such a group be “transformed” into something democratic and/or progressive in any way? If Franco’s Falange still existed today, would you argue that they have progressed? How about the NAZIs? It’s not like it was a movement that had its progressive vision but with a touch of fascism, it was a movement built with the sole purpose of protecting the rich’s interests against any potential revolutionary movement, using sectarianism as a tool to get more Christians fighting for them like they were doing it for the better of Lebanon. Fascists exist to save capitalism in its potentially dying phase. There is absolutely no reasons – nor interest – in playing the role of reformist politics. “Unjustified” hatred for Palestinians? Do you have a clue what Palestinians – specifically the PLO – were doing in Lebanon prior to the civil war or how they STARTED the civil war? Geesh, get a history book. The phalanges are not fascists, My goodness who is educating people today? Fascism is just another form of Socialism. It is still the same old all powerful centralized government taking over all forms of industry. I guess I have to explain it again. The political terms Right and Left have a totally different meaning in Europe than they do in America. European countries have histories of monarchy. They do not have the same view of individual rights and of political power in the hands of the People as the USA does. So, to them, the concept of an all powerful centralized government is the only model they know. To them Left or Right refer to two different approaches to reach the same goal, State-ism. The Governments there have nationalized most of the industry. Socialism and Fascism have the same goal. The Nazi Party was the National Socialist Party. The reason the Soviets and Nazis opposed each other was to over which would impose their form of totalitarianism. Neither had the goal of freedom for its people. In America we have no such history. We were founded without any all powerful centralized government. In fact the purpose of the Constitution is to limit the power of the Federal Government. So, in America the political spectrum is way different. Instead of both Right and Left heading in the same direction only on two different tracks, we have them going in opposite directions. Imaging a line. At the Extreme Left is Totalitarianism or total government control. On the extreme Right is Anarchy or no government at all. Now, starting in the middle if you move Left you will find Liberal/Progressive, then Socialist then Totalitarianism. If you start in the middle and move Right you find Conservatism, Libertarianism then Anarchy. That is why Fascism, Communism, Socialism or any other form of government is anti-Capitalism. Why, because the complete name for it is Free Market Capitalism. Fascism has nothing to do with freedom in any way shape or form. Where do you think the concept of a Volkswagen or People’s Car came from? Fascism is just another form of Socialism. It is, by definition, anti-Free Market Capitalism. Fascism has nothing to do with free markets, which are the basis of capitalism. > Fascism cannot co-exist with capitalism or any other form of freedom. > Fascism- a system predicated on the idea that individuals are all government property. > Fascism requires centralized control. > Capitalism- a system predicated on the idea that individuals are each their own property. > Capitalism requires individual choice. > Fascism is LEFT wing. Leftists always proudly said so until “Hitler” became a “dirty word” here. To rehabilitate their image they renamed themselves from “Progressive” to “Liberal” but changed NONE of their policy agenda. > Fascism is socialism through government policy rather than through revolution against the government. > Communism is socialism by revolution. Hitler fought communists over TERRITORY and to keep his government intact, NOT over ideology. Your a fool, you do not know anything about fascism, fascism is a form of socialism, under fascism huge socialist reforms were made. Tarek. Your simpleminded article is simply that. Simple minded. You have a preconceived notion and strive to fullfill your false fallacy. Thank you for being so simple. Simply ignorant is a true reflection of this article. “Fascism is a form of socialism… yeah. Very good point from the obvious 15 year old.